LIGO Hanford’s staff of scientists, engineers and technicians are searching for gravitational waves from violent, astronomical events such as collisions between black holes or exploding stars. HANFORD — The signal arrived at LIGO Hanford at 2:51 a.m. on Sept. 14, 2015. Things were quiet at the L-shaped observatory in the desert here near Richland, with only a small crew on duty. Like its twin 2,000 miles away in Louisiana, the Hanford facility was built to detect gravitational waves — strange ripples in the fabric of space-time believed to emanate from cataclysmic events in the cosmos like star explosions. But the system was just gearing up again after a five-year, $205 million upgrade, and no one expected to see results right away. The first scientists to make note of the strange signal were halfway around the world, at the Albert Einstein Institute in Germany. As part of the large research consortium behind the project, it was their job to monitor the automated data stream. 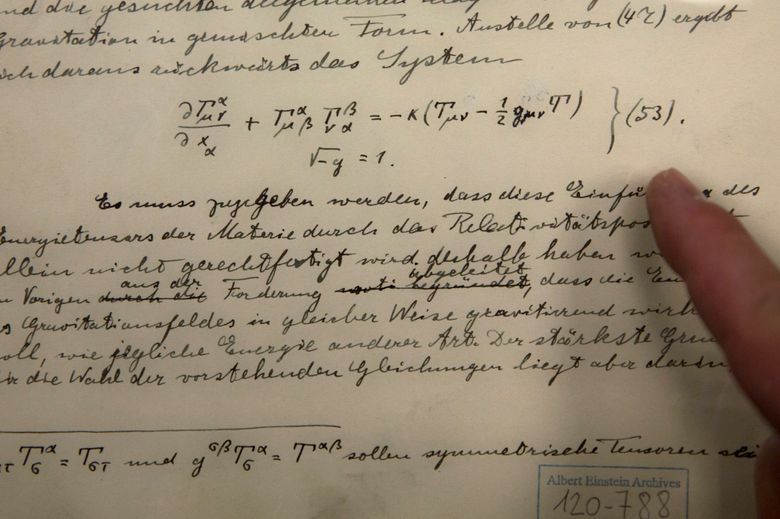 But it also seems especially apt, since Einstein himself first predicted the existence of gravity waves a century ago — launching a long scientific quest to confirm the phenomenon. The German-based researchers alerted their international colleagues via an email message with the subject line: Very interesting event. 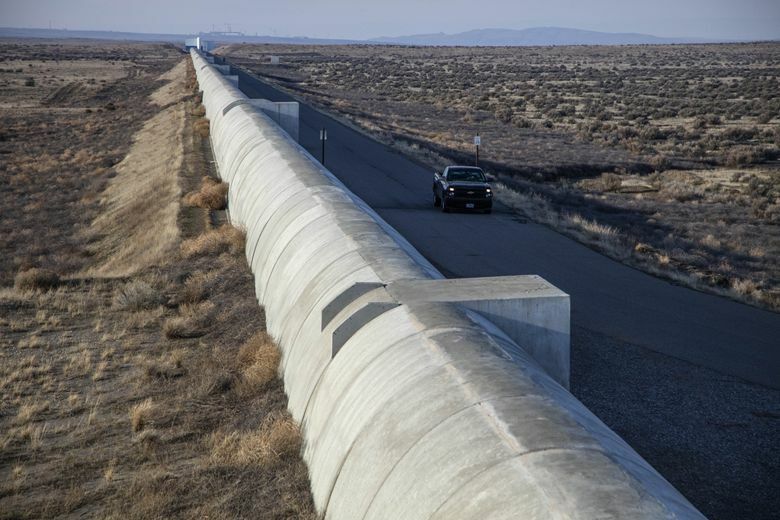 The drama culminated Thursday, when a panel of jubilant scientists reported that the Laser Interferometer Gravitational-wave Observatory had, indeed, detected the waves for the first time. Astronomers hailed the finding as an achievement of historic proportions, one that opens the door to a new way of observing the cosmos and the violent collisions that are constantly shaping it. For them, it’s like turning a silent movie into a talkie because these waves are the soundtrack of the universe. By studying the pattern of energy in the wave, the scientists determined that it came from a pair of massive black holes spinning around each other 75 times a second before colliding and merging in the most powerful event ever detected by humanity. The collision occurred 1.3 billion years ago and the ripples have been traveling across the universe ever since. “It’s mind boggling,” Reitze said. 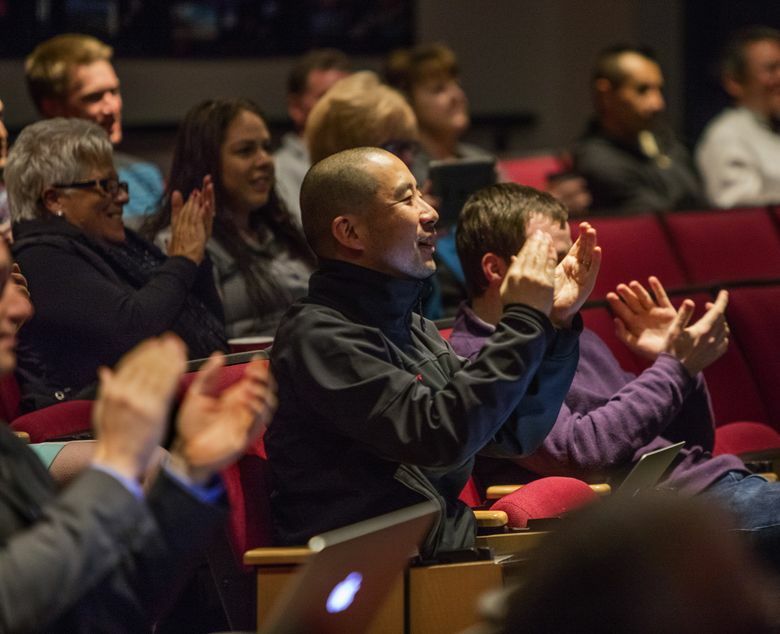 About 60 scientists, engineers and students watched the briefing from an auditorium at LIGO Hanford, clapping, cheering and whooping. By midmorning on Sept. 14, they already had a pretty good idea that the signal was real, said Michael Landry, chief scientist at the Hanford site. There was some high-fiving, and a small party that evening. Other research groups had claimed to see gravitational waves before, but those sightings proved false. So the LIGO team locked down the settings on both instruments exactly as they had been when the signal came in, then collected reams of control data. They checked and rechecked their calculations — and then checked and rechecked them again. “We haven’t slept a lot in the past few months,” said LIGO Hanford Director Fred Raab. The hundreds of scientists involved in the consortium also held to a code of silence, not even notifying officials at the National Science Foundation — which has invested $1.1 billion in the project — until several weeks into the confirmation process. After conducting several long-distance conference calls from home, Raab finally clued in his wife — but then swore her to secrecy. A few rumors trickled out, which was frustrating, he added. Considering the minuscule scale of the actual measurements at LIGO, it’s easy to see why the scientists were wary of making a mistake. The project is rooted in Einstein’s contention that the passage of gravitational waves would slightly warp space and time. The 2.5-mile long, perpendicular arms of the LIGO observatories are designed to capture that warping. A laser beam is split and travels down each arm, bouncing off mirrors at the ends. 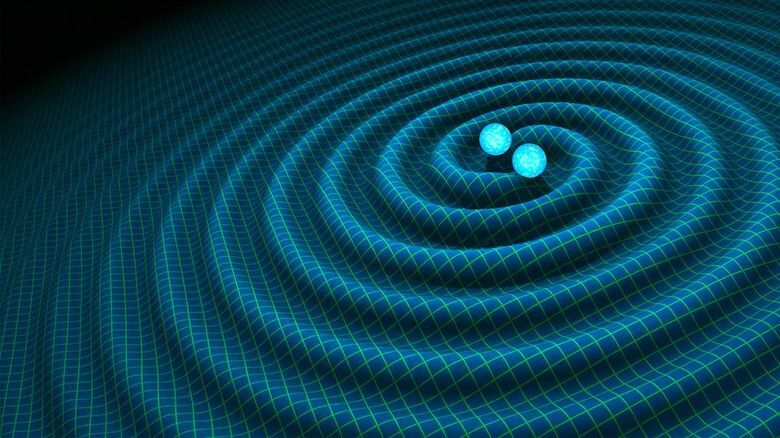 According to the theory, gravitational waves should slightly compress one arm of the observatory and stretch the other, leading to a tiny mismatch in the reflected laser beams — which is what the detector is looking for. When the device reaches its peak sensitivity, which will require a year or more of additional tuning and adjustments, it should be able to detect a mismatch one ten-thousandth the size of a proton. The September signal was relatively large — a whopping few thousandths of the diameter of a proton, Landry explained. The signal arrived first at the Louisiana site, then showed up on the Hanford detectors seven milliseconds later. That means the collision occurred somewhere in the heavens over the Southern Hemisphere, Raab said. Only violent events can create signals strong enough to be detectable. But now that scientists know they can “see” black holes collide, they expect to be able to use gravitational wave observatories as a new kind of telescope to probe events in the distant universe, like neutron stars and supernovae. “We’re opening a new window on the universe — the window of gravitational wave astronomy,” Reitze said. Before the upgrades, the LIGO observatories spent eight fruitless years searching for gravity waves beginning in 2002. The recently completed improvements significantly boosted sensitivity and also helped shield the detectors from interfering ground motion — whether from traffic on nearby roads or earthquakes on the other side of the planet. The most recent round of observations wrapped up on Jan. 12. The next will start later this year. 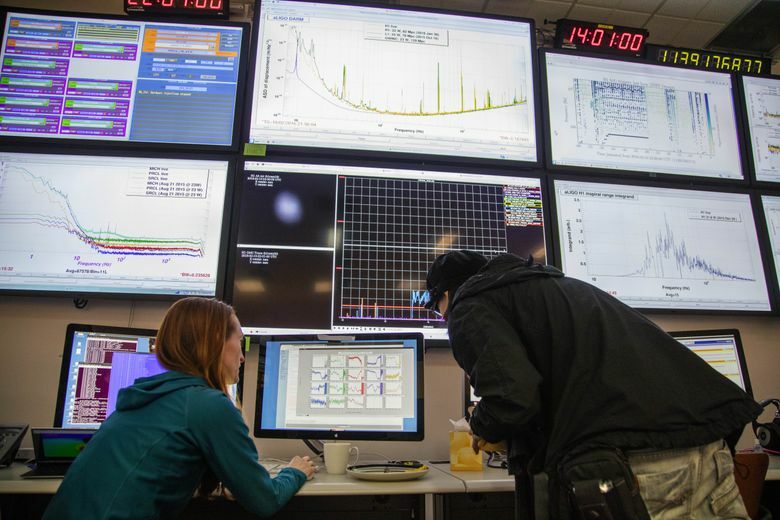 In the meantime, LIGO Hanford’s staff is continuing their efforts to boost the system’s performance by optimizing the alignment of its myriad parts and extinguishing all possible sources of noise. “People here are working flat out,” Landry said. Except for Thursday. That’s when the big party was scheduled.